Bachata is a popular guitar music from the Dominican Republic. Now overwhelmingly successful among Latinos in the United States, bachata took shape over a period of about forty years in the bars and brothels of Santo Domingo, not gaining acceptance in its native land until about ten years ago. Young groups like Aventura have a similar relationship to original bachata as rock and rollers do to the blues, which has languished in the shadow of its more commercially viable descendant. In fact, the parallel between bachata and the blues is marked. Although bachata developed out of, and bachateros play, a variety of different rhythms, notably including merengue, the music which is specifically called bachata is a variant of the bolero. The bolero in Latin culture has traditionally been a romantic music, dealing with themes like deception and lost love. The bachatero, like the bluesman, sings about pain and trouble; one difference, though, is that while the bluesman hops on a southbound freight and keeps moving, the bachatero gets as far as the neighborhood bar and looks for solace in a bottle of rum in a dark corner! The genre has passed through several phases since José Manuel Calderón recorded what is generally recognized as the first bachata single (“Borracho de amor” and “Que será de mi (Condena)”) in 1961. Indeed, long before Calderón, guitar music was the music of choice in the places of ill repute which became home to bachata. 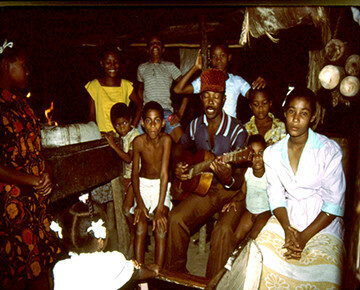 The guitar and guitar music like bolero and son were also the staples of the campo, the countryside, and with the death of dictator Rafael Trujillo in 1961 a number of musicians left the campo to record in the capital. The dictator’s family had virtually monopolized the music industry in the country, and when he was killed entrepreneurs began recording the first generation of bachateros. At this point the music was not yet referred to as bachata, but rather as “bolero campesino”. The word bachata originally denoted an informal party where guitar music was generally played—only later did it come to signify the music itself, and then in a denigrating manner. Deborah Pacini Hernandez's book, "Bachata A Social History of a Dominican Popular Music", was one of the sources for this article. David Wayne also draws on first hand experience from his years living in the Dominican Republic, interviews conducted with bachata musicians, and work as a guitarist in numerous bachata bands.